Crosslin Smith, Cherokee medicine person and grandson of Chief Redbird Smith, stresses the need for all to understand and return to old traditions, saying, "We are losing the meaning of what we do." Smith speaks of the beginnings of the Stomp Dance which he described as a unifying activity where one should leave attitude, ego, and emotion behind to honor and be in unity with the spirits of all those around you and with the spirits of the old ones who lived before. Redbird Smith (left), and Bluford Sixkiller, Asst. Chief (right), instructing children in the Keetoowah Ritual. The circle is a familiar symbol to traditional Cherokees. The Stomp Dance and other ceremonies involve movements in a circular pattern. In ancient times, the fire in the council house was built by arranging the wood in a continuous "X" so that the fire would burn in a circular path. The rivers, or "Long Man," were always believed to be sacred, and the practice of going to water for purification and other ceremonies was at one time very common. Today, the river, or any other body of moving water such as a creek, is considered a sacred site, and going to water is still a respected practice by some Cherokees. The everyday cultural world of the Cherokee includes spiritual beings. Even though the beings are different from people and animals, they are not considered "supernatural." They are very much a part of the natural, or real, world and most people at some point in their lives, have an experience with spiritual beings. One group of spiritual beings still talked about by many Cherokees, are the Little People. They are invisible unless they want to be seen. When seen, they look very much like any other Cherokee, except they are very small, and have long hair, sometimes to the ground. The Little People live in various places, such as rock shelters, caves in the mountains, laurel thickets, etc. They like drumming and dancing, and they often help lost children. Not only physically lost, but sometimes saddened children and those who are going through the tough times of growing up. They are also known to be quite mischievous at times. The Little People need to be dealt with carefully, and it is necessary to observe the traditional rules regarding them. They don’t like to be disturbed, and they may cause a person who continually bothers them to become 'puzzled' throughout life. Because of this, traditional Cherokees will not investigate or look when they believe they hear Little People. If one of the Little People is accidentally seen, or if he or she chooses to show himself, it is not to be discussed or told of for at least seven years. It is also a common practice to not speak about the Little People after night fall. As far as the witches referred to above, there are ordinary witches and killer witches. Ordinary witches are considered more dangerous since a person can never be sure he is dealing with one, and they are more difficult to counteract. They may deceive a medicine person, and cause them to prescribe the wrong cure if not guarded. One killer witch who is still spoke of often in the Cherokee Nation is the Raven Mocker. The traditional religious dance of the Cherokee is the Stomp Dance at a sacred dance site. The sacred fire is kept burning constantly which is built by the fire keeper and his assistant. A firekeeper and the assistant begin early in the day at dawn, stoking the burning embers into a large fire for the dance. Seven arbors are located around the fire and dance area. They are made from large poles with brush for the roofs. Each arbor is reserved for one of the seven clans. Seats are placed between the arbors for visitors. The dance ceremony cannot begin unless each clan is represented. Women prepare a meal for the day, which consists of traditional and modern food such as brown beans, cornbread, all kinds of pies, cakes, homemade biscuits, salad, ice tea, coffee, kool aid, chicken, and if in season, kanuchi, wild onions with eggs, bean bread and much more. At sundown, the sermons continue. The Chief brings out the traditional pipe, and fills it with tobacco. He lights it with a coal from the Sacred Fire, and takes seven puffs. The Medicine Man from each clan, beginning with the Aniwaya, the Wolf clan, takes seven puffs from the pipe and passes it on . The chief, medicine men and elders hold a meeting and then issue the call for the first dance, then the second call. The first dance is by invitation, tribal elders, elders, medicine men and clan heads. The members gather to visit and dance until sunrise. Each individual ground has it’s own schedule for the dances, which is a holy place to worship God. All grounds post signs requesting no rowdiness, liquor, and general respect. Two major ceremonies are held at the Redbird Smith Ground, one commemorating the birth of Rebdird Smith, and the other expresses appreciation to the Creator for a bountiful harvest. Stomp Dance participants include a leader, assistants, and one or more female shell shakers who wear leg rattles traditionally made out of turtle shells filled with pebbles. Some wear shakers made from small milk cans. The shakers provide rhythmic accompaniment while dancing around the fire, and a dance cannot begin without the shakers. A series of wampum belts serve to record and ‘read’ the traditional beliefs and stories. The belts are very old, and are made of wampum beads sewn together with a form of seaweed from old Mexico. The wampum belts are shown only on very sacred occassions. The history of the belts relate that many years ago, the tribe was preparing to go to war. The medicine men foresaw which would survive, and cut the original wampum belt into seven pieces. After the war, the belts were scattered, and the last one was recovered by Redbird Smith in the very early 1900’s. The fire is very sacred to traditional Cherokees. It is built at the bottom of a pit below the ground, and burns constantly. It is believed by traditional Cherokees that soon after creation of the Cherokee people, the Creator left his throne in Heaven and visited the earth. He chose four Cherokee men who were strong, healthy, good and true, and believed with all of their heart in the Creator. They were each given a name: Red, Blue, Black and Yellow. Each was given a wooden stick that was very straight, and was told to place one end of the stick on a surface that would not burn. He said to place the other end in their hands, and start this material that would not burn to magically burn. . . by giving the sticks a circular, rotating motion. When this was done, and all the sticks were burning, they were told to go to the center of the cross, and there the four would start one singular fire. This fire would burn for all time, and be the Sacred Fire. The fire was started with the instructions and help of the Creator. The Sacred Fire has been held since that time by the Cherokee, and is kept alive by the Chief, Assistant Chief, Firekeeper, and Assistant Firekeepers of the Ground. Today, there are over 200,000 Cherokee tribal members. Although some have chosen to worship through other religious denominations (Indian Baptist, Methodist, etc. ), many continue to worship at regular Stomp Dances and are members of one of the several Grounds in Cherokee Nation. Each ground has its own unique protocol and differences, but the general worship is similar with the same intention. 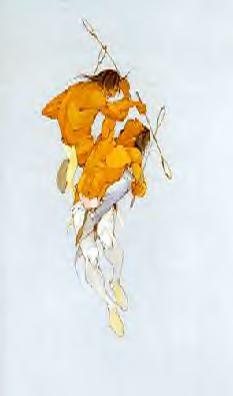 A-ne-jo-di, or Stickball, is a very rough game played by not only the Cherokee, but many other Southeastern Woodland tribes including the Muscogee (Creek), Seminole, and others. The game resembles the modern European game of LaCrosse, using ball sticks which are handmade from hickory. A small ball, made of deer hair and hide, is tossed into the air by the medicine man. The male players use a pair of the sticks, and female players use the bare hands. In earlier times, only the men with the greatest athletic ability played the game. The game was oftentimes played to settle disputes, and the conjurer for each team often became as important to the team as the players themselves. Seven points are scored when the ball strikes a wooden fish on the top of a pole approximately 25 feet in height, and two points are awarded when the ball strikes the pole. In earlier days, there would be a dance before the ballgame. The ballplayers were the participants of the dance, along with seven women dancers. Each woman represented one of the clans. Throughout the dance, the women would step on black beads which represented the players of the opposing team. The conjurer had placed these black beads on a large flat rock. Today, stickball is an important part of the days activities at ceremonial Stomp Grounds, being necessary to play before the Stomp Dance can ever begin. It is also a recreational sport at other times between community teams. There are also intertribal teams made up of players from Cherokee, Muscogee (Creek), Yuchi, Natchez, and other area communities. The traditional religious dance of the Cherokee is the Stomp Dance at a sacred dance site. The sacred fire is kept burning constantly which is built by the fire keeper and his assistant. A firekeeper and the assistant begin early in the day at dawn, stoking the burning embers into a large fire for the dance. Seven arbors are located around the fire and dance area. They are made from large poles with brush for the roofs. Each arbor is reserved for one of the seven clans. Seats are placed between the arbors for visitors. The dance ceremony cannot begin unless each clan is represented. Women prepare a meal for the day, which consists of traditional and modern food such as brown beans, cornbread, all kinds of pies, cakes, homemade biscuits, salad, ice tea, coffee, kool aid, chicken, and if in season, kanuchi, wild onions with eggs, bean bread and much more. At sundown, the sermons continue. The Chief brings out the traditional pipe, and fills it with tobacco. He lights it with a coal from the Sacred Fire, and takes seven puffs. The Medicine Man from each clan, beginning with the Aniwaya, the Wolf clan, takes seven puffs from the pipe and passes it on . The chief, medicine men and elders hold a meeting and then issue the call for the first dance, then the second call. The first dance is by invitation, tribal elders, elders, medicine men and clan heads. The members gather to visit and dance until sunrise. Each individual ground has it’s own schedule for the dances, which is a holy place to worship God. All grounds post signs requesting no rowdiness, liquor, and general respect. Two major ceremonies are held at the Redbird Smith Ground, one commemorating the birth of Redbird Smith, and the other expresses appreciation to the Creator for a bountiful harvest. Stomp Dance participants include a leader, assistants, and one or more female shell shakers who wear leg rattles traditionally made out of turtle shells filled with pebbles. Some wear shakers made from small milk cans. The shakers provide rhythmic accompaniment while dancing around the fire, and a dance cannot begin without the shakers. A series of wampum belts serve to record and ‘read’ the traditional beliefs and stories. The belts are very old, and are made of wampum beads sewn together with a form of seaweed from old Mexico. The wampum belts are shown only on very sacred occassions. The history of the belts relate that many years ago, the tribe was preparing to go to war. The medicine men foresaw which would survive, and cut the original wampum belt into seven pieces. After the war, the belts were scattered, and the last one was recovered by Redbird Smith in the very early 1900’s. was told to place one end of the stick on a surface that would not burn. He said to place the other end in their hands, and start this material that would not burn to magically burn. . . by giving the sticks a circular, rotating motion. When this was done, and all the sticks were burning, they were told to go to the center of the cross, and there the four would start one singular fire. This fire would burn for all time, and be the Sacred Fire. The fire was started with the instructions and help of the Creator. The Sacred Fire has been held since that time by the Cherokee, and is kept alive by the Chief, Assistant Chief, Firekeeper, and Assistant Firekeepers of the Ground. regular Stomp Dances and are members of one of the several Grounds in Cherokee Nation. Each ground has its own unique protocol and differences, but the general worship is similar with the same intention. To follow-up on this story...read "The Ball Game Between the Birds and the Animals"